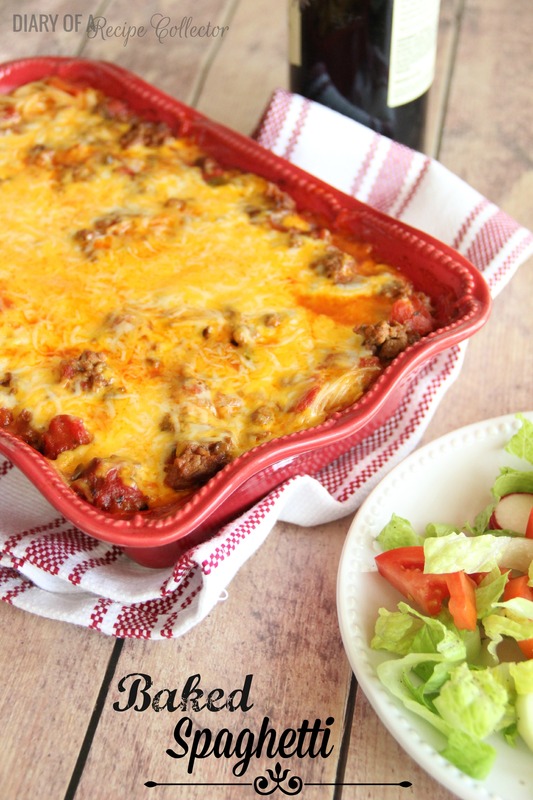 Baked Spaghetti – Layers of homemade meat sauce, angel hair pasta and cheese make this the perfect spaghetti! It’s great for company too! Everyone usually has their favorite spaghetti recipe. This one happens to be mine. It is spaghetti that goes one extra step, and it is so worth it! The key to this spaghetti is skipping the jar sauce and also going with angel hair pasta. You layer it with cheddar and jack cheese. It is great for a family gathering too. In a large pot, brown the ground beef, onions, bell peppers, and garlic. Add in the diced tomatoes, tomato sauce, water, parsley, oregano, basil, salt and pepper, sugar, and bay leaves. Bring to boil and reduce to a simmer, covered for about an hour. Shortly before this is finished, boil the angel hair until it is just barely done and drain. Preheat oven to 350 degrees and assemble the spaghetti in a 9 x 13 casserole dish. Begin by covering the bottom with sauce. Add ½ of the angel hair, and top with a third of the cheddar and a third of the jack cheese. Repeat with half of the remaining sauce, rest of angel hair, next third of cheeses, rest of sauce. Bake in oven for 30 minutes, uncovered. Top with remaining cheese and bake an additional 5 minutes. Let sit for about 10 minutes before serving. *This recipe can be halved easily. You can also split it between two smaller casserole dishes and freeze one of them prior to baking. Enjoy with a nice salad and garlic bread! hello! This looks so good! will be making this one! this will probably be my youngest fav dish! I love this recipe, and it’s been a hit when I make it for others. Making it tonight for company! So glad to hear that Michelle! I love to make this for company too!